This gallery of equipment images is designed to help you identify common types of mass excavating and loading equipment used in construction and mining, both past and present. Elevating grader: 1917 Russell Township A. 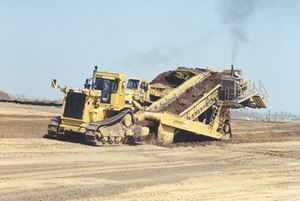 Pulled by stock, later by a tractor, the elevating grader scoops dirt onto an inclined conveyor that passes it across the loader’s direction of travel. Belt Loader: 1959 Kolman 101. The material to be loaded is banked over the near end, and the conveyor transfers it to a deck screen at the other end. The screen sorts the material into two trucks. 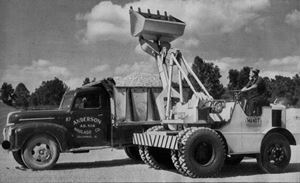 Force-feed Loader: 1962 Pettibone Speed-Loader. 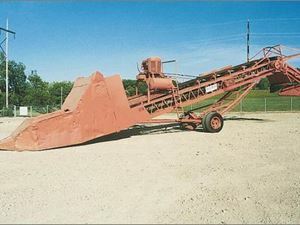 Introduced in the 1940s, the force-feed loader straddles a windrow, gathers it up onto a conveyor, and loads it into a truck following behind. 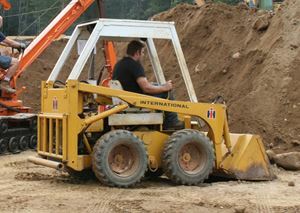 Belt loader: 1990s Holland 710. These huge loaders are designed to move dirt as efficiently as possible; its 9-foot-wide conveyor can load a 120-ton capacity truck in less than a minute. 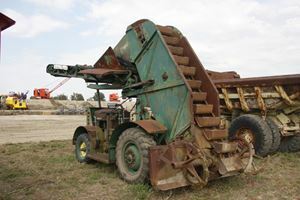 Bucket loader: Barber-Greene 543. Invented in the 1910s, the bucket loader used an inclined bucket elevator and a discharge chute or conveyor to load trucks. Wheel loaders replaced them in the 1960s. 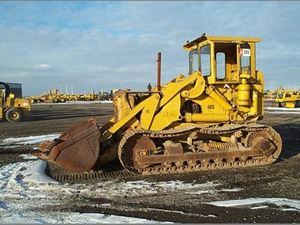 Crawler loader: 1948 Cat D2 with Trackson T2 Traxcavator. 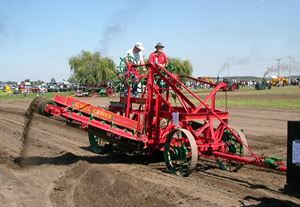 The first loaders were cable-operated attachments mounted to tractors. This design originated in the late 1920s and was phased out in 1952. Crawler loader: 1957 Cat 977D. The all-hydraulic crawler loader attachment was perfected in 1946, and in 1954 Cat’s No. 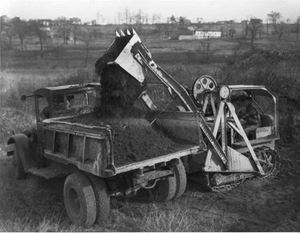 6 Shovel was the first machine built from the ground up as a crawler loader. Multi-Terrain Loader: Since the 1980s, loaders and tractors have been made with wide tracks for use in soft or sensitive ground. The wider tracks leave less imprint by supporting the machine’s weight. Overshot loader: For use in confined areas, some loaders from the 1930s through 1960s dumped by hoisting the bucket forward – or back – over the tractor to dump at the other end without turning. Wheel Loader: 1940s Scoopmobile B. 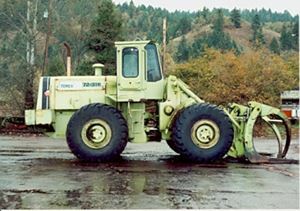 Like the Trackson Traxcavator, the first wheel loaders operated by cable. The Scoopmobile was pulled behind a truck and steered from the handle over the seat. 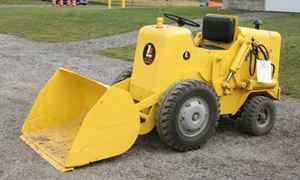 Wheel Loader: David Brown 1200. The idea of mounting a loader attachment on a tractor is still practiced on farm tractors. Industrial Wheel Loader: 1956 Hough HAC. 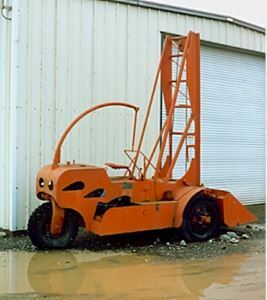 From the 1940s until the skid-steer loader replaced them, these small loaders were used in warehouses, ship’s holds, boxcars and other industry applications. 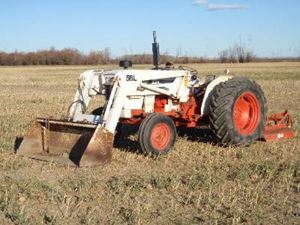 Skid-steer Loader: 1969 International 3200A. 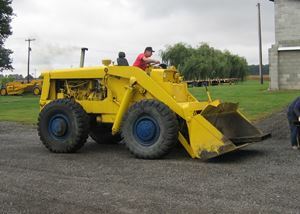 Developed in 1957, the skid-steer turns by stopping motion of one tire or another, rather than by angling the wheels. Wheel loader: 1976 Trojan 4000. 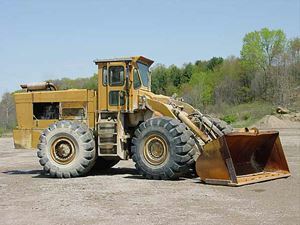 Most modern wheel loaders steer from an articulation joint behind or ahead of the cab. Developed by Mixermobile Manufacturers in 1955, it became standard in the 1960s. Swing loader: 1950s Mandt 78. Some wheel loaders are built with booms that swing left or right for work in confined areas. Such loaders are popular in railroad maintenance. Log loader: Terex 72-31B. Wheel loaders and similar machines can be equipped with a wide variety of attachments. This example has forks for loading and handling logs. Loader/landscaper: Case 990. Combining a loader and a rear-mounted box scraper or blade results in a handy machine for site grading and light earthwork. 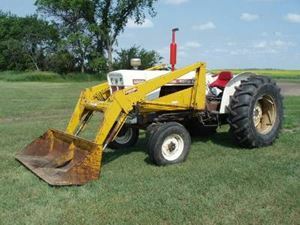 Loader/backhoe: 1967 Case 580. 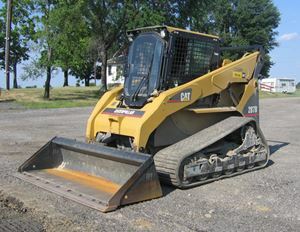 This very common machine combines the features and functions of a wheel loader and a hydraulic backhoe into a single, very versatile and highly mobile machine. Bucket Wheel Excavator: Used mainly to strip overburden from coal seams, the Bucket Wheel Excavator is the largest excavating machine ever built. 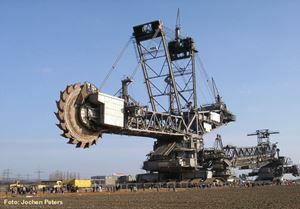 The largest weighs 15,650 tons!